In SAINTS AT THE RIVER, the drowning of a thirteen-year-old girl, swept away in a whitewater river while on vacation, divides a small Appalachian town. This tragedy brings a young woman journalist to the community of her childhood, and on a trip back home that forces her to confront issues buried in her past. 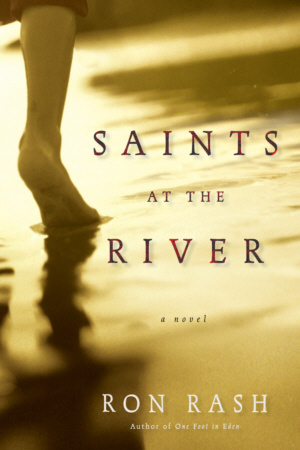 SAINTS AT THE RIVER is the second novel by the award-wining author of ONE FOOT IN EDEN. Highly regarded as a poet, Rash’s ancestors have lived in the Appalachian region of the United States since the 1700s. In both fiction and poetry, Ron Rash’s work is marked by his love of this landscape, and his sensitive explorations of the ties of family and the fierce hold the dead have on the living.